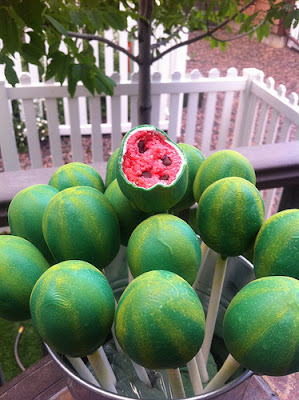 I love love LOVE these cute watermelon cake pops from Lollicake. I saw them over at Cupcakes Take the Cake. There isn't a tutorial, but I am thinking pink cake with chocolate ships dipped in green candy melts, and maybe a yellow edible marker? You can check out more of Lollicakes super cute cake pops HERE. Oh my gosh, these are too cute! I'd thought I'd seen it all on a stick, but then you shared these! Love it! I saw these at Cupcakes Take the Cake too and was trying to figure it out! I think she dipped them in white chocolate first (see the white "rind") and then green. Im thinking yellow luster dust might work for the stripes too. Or maybe paint it on with some gel coloring? I so have to try these!! LOVE these! Thanks for sharing this link, I had never been to this cute blog! Wow...these are awesome! Thanks for sharing! These are really cute and look yummy too! Thanks for the post! !